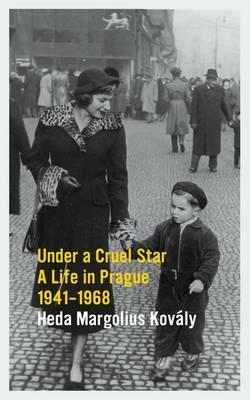 When I saw Under a Cruel Star by Heda Margolius Kovály, a memoir about life in Czechoslovakia from 1941 to 1968, in the House of Anansi catalogue last spring, I immediately asked if they would send me a copy. They, being extraordinarily kind and exceeding prompt, did so immediately and I am ashamed that it took me until October to finally read it because it is truly an extraordinary book. It is the sustained power of the book that is most remarkable. Beginning with Kovály’s wartime experiences in the Lodz Ghetto and then in a labour camp and continuing through until the autumn of 1968, when she left Prague after the Russian invasion, there is not a single moment when her story lags. It is horrifying, capturing some of the worst features of the 20th Century, but mesmerizing and wonderfully told. People often asked me: How did you manage? To survive the camps! To escape! Everyone assumes it is easy to die but that the struggle to live requires a superhuman effort. Mostly, it is the other way around. There is, perhaps, nothing harder than waiting passively for death. Staying alive is simple and natural and does not require any particular resolve. When she finally reaches her home, when she returns to Prague…for me this was the most affecting portion of the whole book. She wanders from friend to friend, trying to find someone who will shelter and help her. Her best friend, who had sworn when Kovály and her family were deported to do all he could for them, is horrified when she appears at his door and rushes her away. Other can supply food, some clothes, maybe a bed for night but there is no warm welcome to greet her. After so many years spent living under Nazi rule, everyone is terrified and fear is the most common reaction to Kovály’s sudden appearance at their doors. And why not? After years of occupation and with the war’s end in sight, “what”, as one of Kovály’s friends asks, “sense is does it make anyway to risk one life for another?” The posters in the streets, listing the names of people – sometimes entire families – killed for trying to help people like Kovály are a daily reminder of what danger her friends face by being in contact with her. At other times, it would not turn out so nicely. The prewar friends would not make tea, would not suggest any mistake. They would just laugh and say in astonishment, ‘Come on now, do you really believe we would store your stuff all through the war, exposing ourselves to all that risk just to give it back to you now?’ And the survivor would laugh too, amazed at his own stupidity, would apologize politely and leave. Once downstairs he would laugh again, happily, because it was spring and the sun was shining down on him. It would also happen that a survivor might need a lawyer to retrieve lost documents and he would remember the name of one who had once represented large Jewish companies. He would go to see him and sit in an empire chair in the corner of an elegant waiting room, enjoying all that good taste and luxury, watching pretty secretaries rushing about. Until one of the pretty girls forgot to close a door behind her, and the lawyer’s sonorous voice would boom through the crack, ‘You would have thought we’d be rid of them finally, but no, they’re impossible to kill off – not even Hitler could manage it. Every day there’re more of them crawling back, like rats…’ And the survivor would quietly get up from his chair and slip out of the waiting room, this time not laughing. On his way down the stairs his eyes would mist over as if with the smoke of the furnaces at Auschwitz. Those who had compromised their integrity during the Occupation now began to calculate and plan, to watch and spy on each other, to cover their tracks, eager to secure the property they had acquired through collaboration with the Germans, by cowardice or denunciation, or by looting the homes of deported Jews. Their sense of guilt and fear of retribution soon bred hate and suspicion directed mainly at the real victims of the Occupation: the active and passive resisters, the partisans, the Jews, and political prisoners; the honest people who had stood their ground and had not betrayed their principles even at the cost of persecution. The innocent became a living reproach and a potential threat to the guilty. I will never agree with their reasons for being attracted to communism, but she makes their choice understandable and sets up the tragic situation that they, with Rudolf’s role in the government as Deputy Minister for Foreign Trade, help create. By the early 1950s, Kovály realises that communism – or at least the communist government her husband is part of – is not going to provide the changes they had dreamt of. The longed for equality is more distant than ever, as Party members live ridiculously indulgent lives and the Party itself gives preference to its members of ‘peasant’ stock as opposed to the bourgeois intellectuals, like Kovály. Betraying an interest in theatre, music and literature was something to be avoided at Party banquets, where it was viewed as a sign of elitism. These years, when the horrible corruption and suspicions beginning to take over everyday life, were awfully painful to read about, especially as they ended with Rudolf’s arrest and eventual execution after the sham Slánský trial in 1952. The life of a widow of a traitor is horrible but logistically fascinating. Companies could not afford to hire employees in bad standing with the Party, so it was difficult for Kovály to find legitimate work to support her and her young son, Ivan. The Party was responsible for housing, so naturally Kovály and Ivan were evicted from the nice apartment they had lived in during her husband’s tenure as deputy minister and rehoused in a dirty, frigid hovel. Friends would not talk to her and other parents would not let their children associate with Ivan. That is why they call it totalitarianism: the government truly does have total control over your life. All these young people had been reared in a society walled in by censorship, where the expression of any independent opinion was routinely treated as a crime. What could they know about democracy? How could they even know what they wanted? But as the evening progressed, those of us who were much older grew even more amazed and impressed. We were taken not only by the precision and clarity of the ideas that were voiced but by the high level of the discussion and the discipline of that mass of young people. They knew exactly what they wanted and what they did not want, what was open for compromise and what they refused to give up. Prague is not an uncaring backdrop which stands impassive, ignoring happiness and suffering alike. Prague lives in the lives of her people and they repay her with the love we usually reserve for other human beings. Prague is not an aggregate of buildings where people are born, work, and die. She is alive, sad, and brave, and when she smiles with spring, her smile glistens like a tear. This review is now almost twice the length of what I write for most books, but then Under a Cruel Star is a very special book and probably deserves three or four times more than this. Kovály spent a large portion of her life living ostracized and endangered because of the policies of the governments at the time. That taught her to loathe totalitarianism but it also taught her about people: how little pressure it takes for a friend to abandon you, how weak those communal bonds really are when tested, and how much stronger the instinct for self-preservation is than the instinct to fight for one’s moral beliefs in order to uphold the honour or accountability of their government. Kovály shows neither the worst of humanity nor the best – just the average. The everyman who, under Nazis or Communists, keeps his head down and avoids any entanglements that could cause him or his family trouble, even when he might feel a moral imperative to act. But fear and self-preservation are usually stronger than even the most dearly held ideals. These are the important lessons of the book and also the warnings: self-interest may be natural but it also means the destruction of justice and truth, of trust and a life truly worth living. Great review. Am reading on my iPhone so I may well pop back later with further comments. Claire, what a riveting review of what sounds like an amazing book. It does seem that both Heda Kovály and her book should be better known. Thank you for writing about them. It is amazing, Lisa. It is a very scary book to read but that is what makes it so important. I remember when I first mentioned Under a Cruel Star back in the spring a few people commented to say that they had read it in school or university, so it might not be widely known but at least it is being discussed. I see that it is available for Kindle so I can read it next month while on a beach on Maui. What a beach-read! Have you read THE HOUSE ON PRAGUE STREET? It appeared in my house years ago and my son and I find ourselves re-reading it from time to time. Its about a Jewish girl whose comfortable pre-war life disappears. That is some heavy reading for the beach, Ruth! I am excited that you will be reading it, regardless of location, and am sure you will find it as moving as I did. And no, I haven’t read The House on Prague Street nor had I heard of it before now. Thank you, Ivan. I’ve had your book on my to-read list for a while and will look forward to it even more now that I have read your mother’s excellent memoir. This book was absolutely amazing… I cried at her stumbles and felt light as air every time she saw a glimmer of hope! Two thumbs up! Very helpful for my essay. Thanks this book was a reading for Russian History . It helped alot term is drawing to a close and so many papers. So pleased that you enjoyed Heda’s book as much as I enjoyed translating it into English and later publishing it at http://www.plunkettlakepress.com!